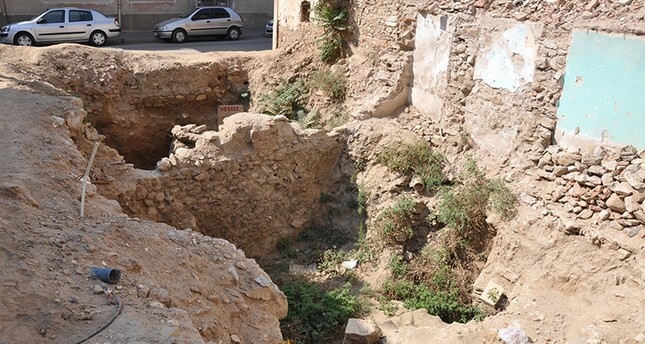 The reconstruction project of an apartment building in Aydın's Efeler district was halted after the discovery of ancient burial chambers during excavations for the building's foundation, leaving homeowners seeking an immediate solution regarding the ancient site, reports said Thursday. Residents sold the land of their old buildings to contractors in exchange for ownership of a new unit in the new apartment, Doğan News Agency (DHA) reported. The residents left their homes and contractors demolished the apartment, to build a new one, but had to stop their work after finding ancient graves during excavations. The Aydın Museum Directorate immediately ordered the suspension of construction work at the site after finding out about the burial chambers, DHA said. Victimized by the delay, contractors and residents of Veysipaşa neighborhood seek a solution and have reportedly submitted a petition regarding the matter. On Aug. 7, Veysipaşa neighborhood local headman Murat Aksoy submitted a petition for the issue to be brought before the Aydın Museum Directorate. In the petition, Aksoy listed the neighborhood grievances and said that the months-long delay is becoming a critical issue for residents as winter approaches. He also noted that rain water is accumulating in the building's foundation, causing structural damage that threatens the structural integrity of the building. In neighborhoods like Veysipaşa, contractors have reportedly begun declining construction requests in fear of similar obstructions. To bring justice to both residents and contractors, the construction project must either be canceled or allowed to continue, Aksoy said in the petition. The discovery of the tomb is not the first to halt construction in the neighborhood. A similar interruption occurred July 10 of this year when the uncovering of a tomb halted another apartment's construction. Most recently, on Aug. 16, a State Hydraulic Works (DSI) project stalled after an archeological discovery. Veysipaşa is one of the oldest areas in the Efeler District, with a wealth of archeological resources below its streets and homes. Local residents and contractors, however, feel the reoccurring problem demands a solution.